Zionsville, Indiana, is a quaint community about 30 minutes north of Indianapolis. It has retained its rural character, but added modern coffee shops, restaurants, and shopping along the historic Main Street. Farms dot the outlying area, inhabited primarily by today’s generations of their founding families. Horses are kept for sport. Until only last year, Main Street featured an equine and tack shop, where one could purchase saddles, bits, and bridles, and be measured for a custom-made pair of English riding boots. Saint Francis in the Fields Episcopal Church sits on a lane in the newer part of town. The Church was originally built in 1968. 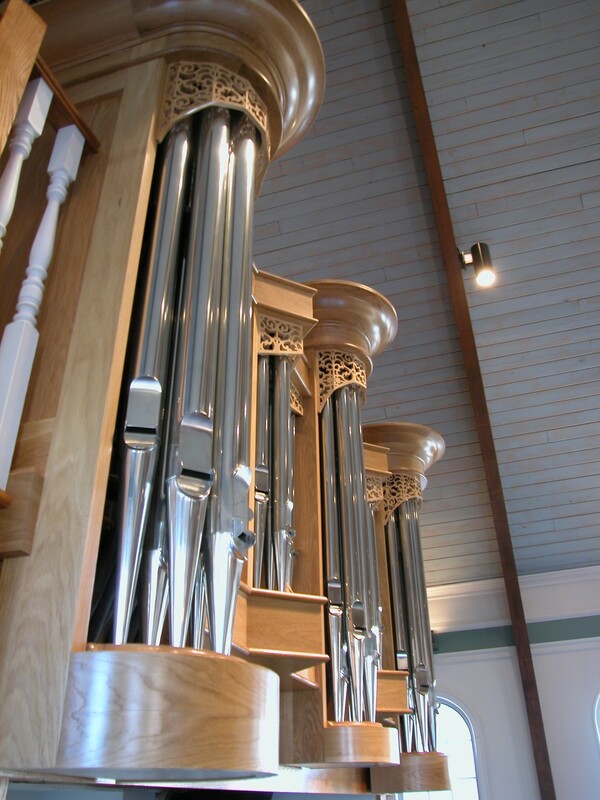 An early 20th century Sanborn tracker action organ was renovated and installed by Goulding & Wood in 1988, and the Church was expanded to its present and complete form in 1997. Indianapolis architect Tim Fleck, of Woolens, Molzen, and Partners, designed and finished the space. 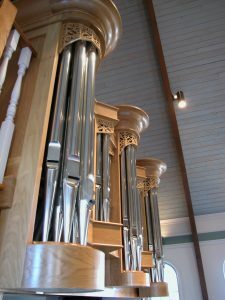 These days it is a luxury for a small rural church to have a pipe organ of any description, and St. Francis used their old tracker organ to its greatest and fullest extent. However, as the Parish and its music program grew, the old instrument was found wanting. In 1992, their Rector, The Rev. Sandra Michels invited me to visit, having heard of the success of our then new organ at the Episcopal Campus Chapel at the University of Illinois. We met, and I offered several recommendations for instruments of differing size. The Church wrestled with a “catch 22”. The building is not so big as to require a large organ to fill it with sound for vigorous hymn-singing. However, the ambitious choral program of traditional Anglican offerings really cried out for tonal variety – which only a somewhat larger instrument could offer. And, of course, since no one at the Church really knew what pipe organs cost, the price came as a real shock. 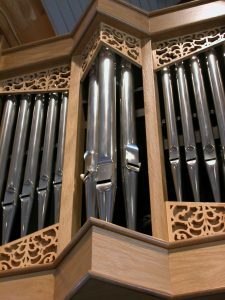 The organ project was shelved, and, as the parish continued to grow, the then new Organist/Choirmaster Lee Barlow, took up the cause afresh for a new instrument. Lee was acquainted with the many tonal and mechanical benefits of slider chests, and the discipline which they bring to good organ design. 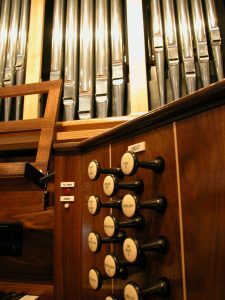 But he also wanted to take advantage of the flexibility which unit work can bring to a well-designed pipe organ, as long as it did not in any way compromise the instrument’s integrity. Having some stops appear on unit chests also became advantageous as we learned that the organ’s initial purchase price had to be limited to a fixed dollar amount, based upon a donation received from a very generous parishioner. Although the donation was certainly significant, the amount was less than a tonally complete organ would cost. 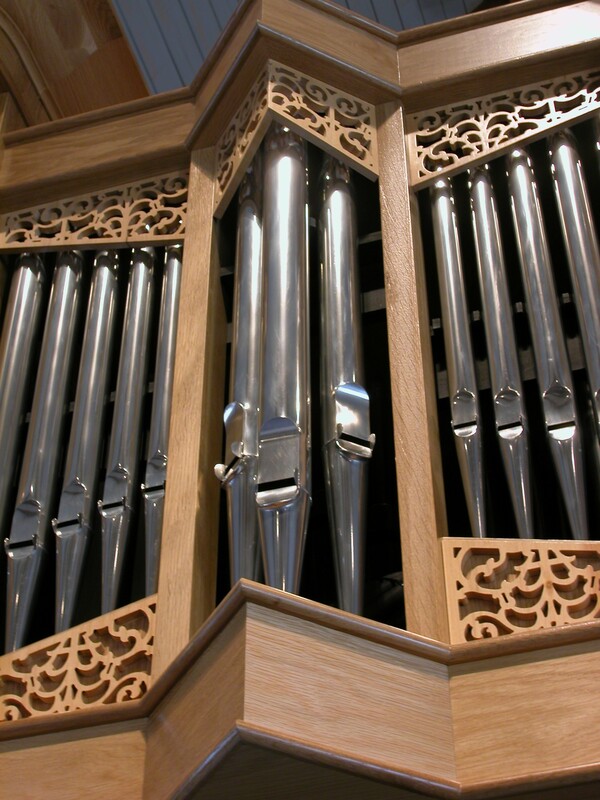 We had to design an organ which could at least initially be built for the amount of the single donation – and be efficiently expandable to the proper size as succeeding contributions were received. 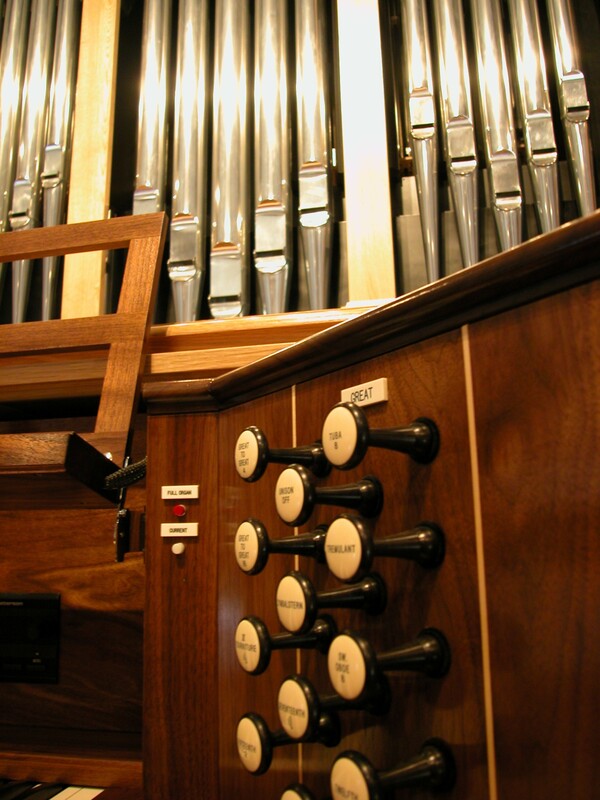 Partially because unit stops are more expensive than stops planted on slider chests, they make good candidates for preparations, and easier reductions to an organ’s initial purchase price. Initially, more stops were prepared for the future than the printed specification shows. Although it was against my nature to do so, I had a positive feeling that the Church would re-instate the important stops in time for them to be included as the organ was constructed in the shop, and indeed they did! The limited balcony space was also an issue. Therefore we opted to place the Great in a case projecting over the balcony rail, and place the Swell and Pedal divisions in a case centered on the balcony floor, at the rear wall, behind the choral singers. We kept the Swell and Pedal case simple, echoing the classical architectural design of the Chancel and its furnishings. The slightly more fanciful Great case relates to the building’s round window frames in its use of rounded towers with rounded pipe shades. Roman mouths in the façade pipes tie both cases together nicely. The cases are made of 1 1/2″ thick solid white oak, with walnut and basswood accents. The front case’s pipe shades are carved—albeit by machine—in a 19th century pattern. The console is also made of 1 1/2″ thick white oak, with polished walnut interior accents, keyboards, slips, nameboard, and drawknob wings. The action is primarily electrically operated slider and pallet windchests. The unit stops have expansion chambers built into every note’s toe and valve holes, to replicate the speech and repetition characteristics of the slider chest magnets. Our treatment of the actions and chests encourages beautiful speech, and reconciles the slight difference in repetition characteristics between the slider stops and the unit stops. In small organs, every note of every stop is crucial to the entire organ’s tonal structure. And, dividing the organ with the Great over the rail poses some listening challenges for the organist. We like for the Swell to balance the Great. Absent a Swell 8′ Diapason, the Swell Salicional and Stopped Diapason blend together to create a composite foundation tone, and balance the Great Diapason. Once the foundations are set, their choruses are built up from these references. Since the Swell is further away from the listeners in the Nave, the Swell Salicional sounds very bold indeed at the console. But, for accompanying, it is at a perfect point for softer contexts when the expression box is partially or fully closed. Just as Diapasons are the meat of the sound, the reeds, strings, and flutes are the spice in the cooking! The flutes are all different, and colorful. The Great uses our cheeky 8′ Flûte à Bibéron, or “baby-bottle” flute; the Swell, a smoky wooden 8′ Stopped Diapason. The 4′ flutes’ construction is opposite that of the 8′ stops, so that their sounds blend better, and provide contrast between divisions. The Swell strings are lush and beautiful, and lend themselves nicely to being super-coupled with the expression box closed at just the right “moment” in an anthem or improvisations. The Swell and Pedal Bassoon/Oboe is fundamental and mildly powerful in the bass, but becomes more hollow and plaintive as it enters the manual compass. As is typical of our Oboes, it is primarily meant to color the flues for accompanying, but is also a lovely, lyrical soft solo voice. The Swell Trumpet is slightly on the dark side, in deference to the nature of the small room, but remains interesting by virtue of the open, tapered shallot openings, and slightly thinner tongues, weighted at the ends. When installed, the Pedal Trombone, an independent Pedal reed, will be on slightly higher pressure so that it can have a measured profundity. The future Tuba (note I have not used the adjective “Major” in its nomenclature) will be on moderately high wind pressure, the top three octaves of which will be horizontally mounted at the top of the Swell case’s Pediment. Thanks to the Rector, The Rev. Sandra Michels; Organist/Choirmaster Lee Barlow; and Dr. Marilyn Kaiser, who assured the Church that this organ wasn’t going to be too big for the space! Thanks also to the dedicated people on my staff who continue to build some of the most inspired instruments in America!